Bet you didn’t know I could knit? You may have noticed that I haven’t blogged yet in December. I have crafted many different excuses in my head, but while I could cite changes at work and the snowpocalypse I’m not going to. When I really think of why I haven’t blogged it’s because I was a little bit bored. Bored of always thinking about eating, of always writing the same sorts of posts, the pressure of good photography in poor light and feeling tied to the whole process. I realised that while this is, and always will be, a food blog at its core that every single post does not have to conform to that label. We all have many skills, many loves, many interests and I feel that my blog should show more than a single side to me. A more rounded blog will hopefully mean a more rounded Lauren and more blog posts on CoffeeMuffins. In the future, starting from today, I may branch out of the food blogging box. Hopefully to show you something cool or cute from some other aspect of my life. I also swear I will never talk about myself in the third person again! December is all about snuggling up to the fire watching the slowly rotating decorations on the tree, with a mug of spice infused coffee and keeping warm. Especially when the pavements have turned to skating rinks and parking spaces turned to 6 foot piles of snow. With more snow forecast it seems perfect timing to me to stay in and sit beside the fire with balls of brightly coloured wool. 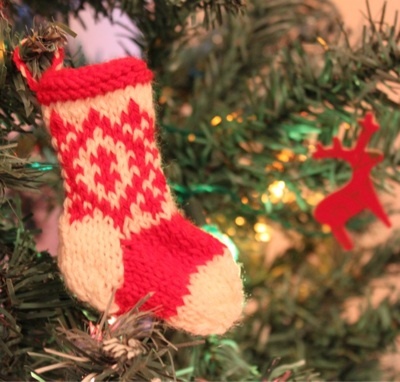 My two main projects have been knitting cushion covers and mini Christmas stockings. 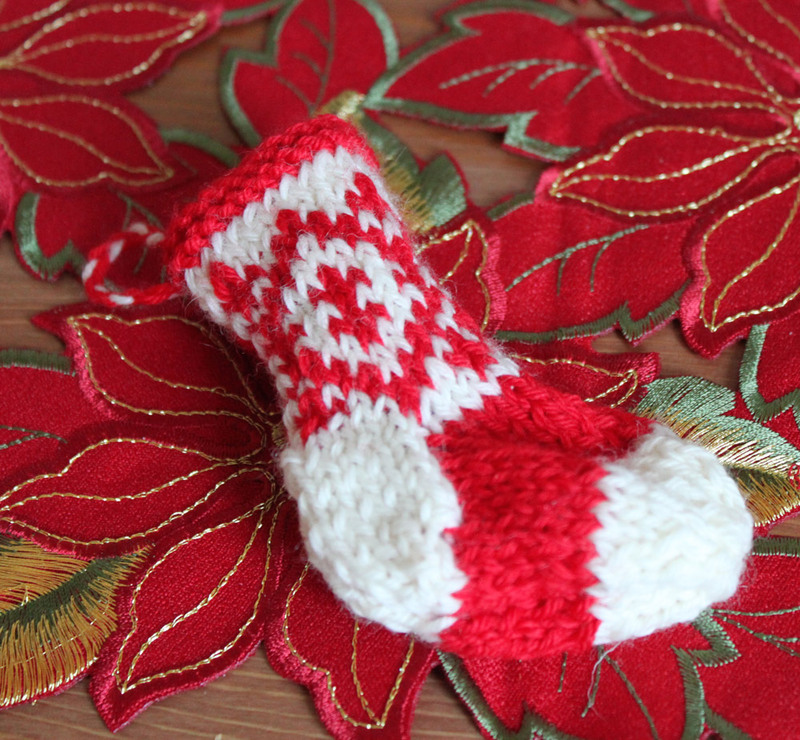 The mini christmas stockings are fantastic for me as a beginner, as they step away from the basics of knitting large squares and delve into changing colours, following patterns and creating different shapes. With the added bonus that it only takes me a couple of hours start to finish. You still have time to make them before Christmas! Plus I think they look amazing as decorations on the tree. I started off in November making the blue stocking, as I wanted to get started but didn’t want to wait for my red wool to arrive. It worked out for the best because it was a tough learning process. I made many mistakes just from not really understanding what I was trying to do. The blue stocking looks pretty awful, and instead of ripping it and starting it again I’ve left it as a reminder of all the things not to do on subsequent attempts. 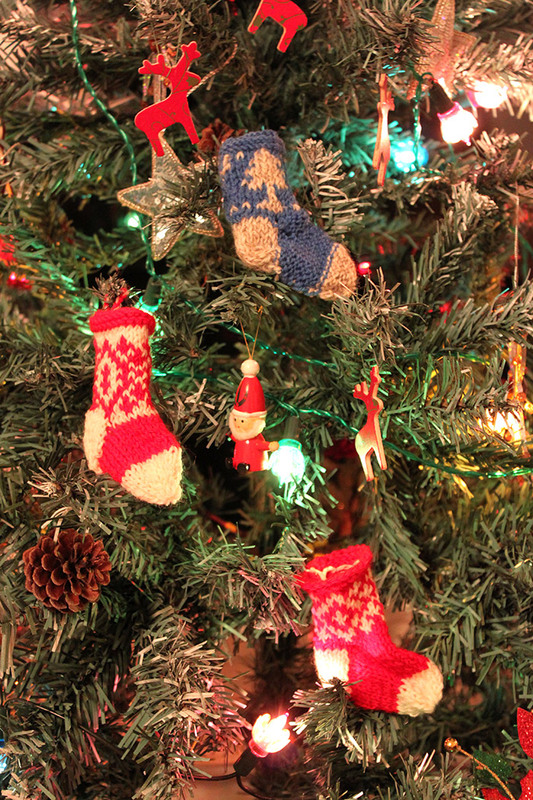 Thankfully when I did finally get the red wool I made two fairly passable stockings! To create these I used these directions on how to make mini christmas stockings from little cotton rabbits.